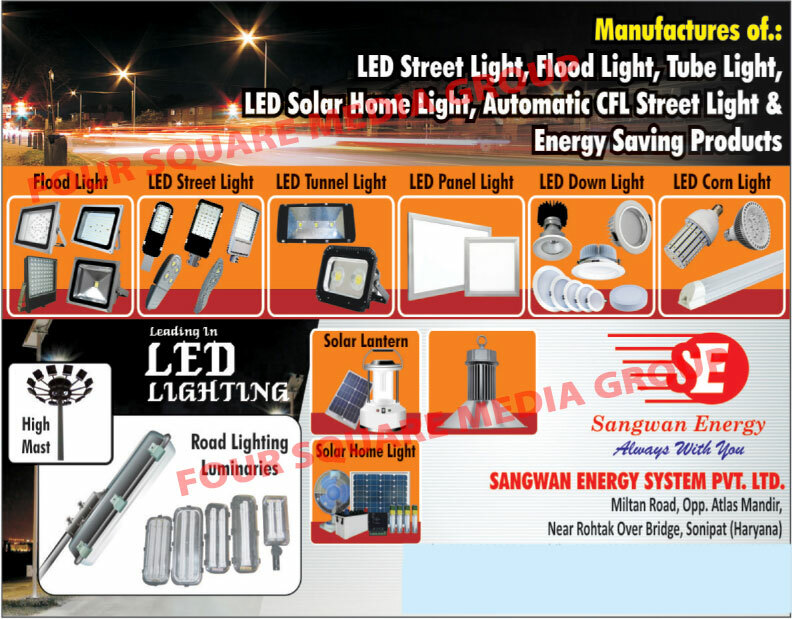 Sangwan Energy System Pvt. Ltd. Led Flood Lights, Led Street Lights, Led Tunnel Lights, Led Panel Lights, Led Tube Lights, Led Bulbs, Led Lights, Led Down Lights, Led Corn Lights, Solar Lanterns, Solar Home Lights, High Mast Lights, Road Light Luminaries, Led Solar Home Lights, Automatic CFL Street Lights, Energy Saving Products, Road Light Luminaries, High Masts, Led Road Lights, Led Disc Down Lights, Led Surface Square Down lights, Led Surface Round Down Lights, Led Recessed Down Lights, Led High Bey Lights, Led Lamps, CFL Street Light Luminaries, Solar Home Systems, Solar Water Heaters, Solar Products, Solar Street Lights, Solar Power Lanterns, Solar LED Lanterns, Led Beam Lights, Solar Lights, CFL Lights, Solar Inverters, Indoor Lights, Flood Lights, Solar Lanterns as an active Manufacturer, Supplier, Dealer, Distributor, Trader and Seller etc. (*Importer/Exporter/Service Provider).